Whilst I am not a fan of Field of Glory (FoG) – the table top miniatures rules – for big ancient battles I still prefer De Bellis Magistrorum Militum (DBMM), I love Field of Glory online. Travelling a fair bit, as well as living on one side of Singapore to my local opponent means not so many face-to-face games. FoG Online from Slitherine is well executed computer based wargame. It seems a good interpretation of the FoG rules but with the computer doing all the mental work, I can’t see any of that and just see the probabilities on combat and the results of those combats. 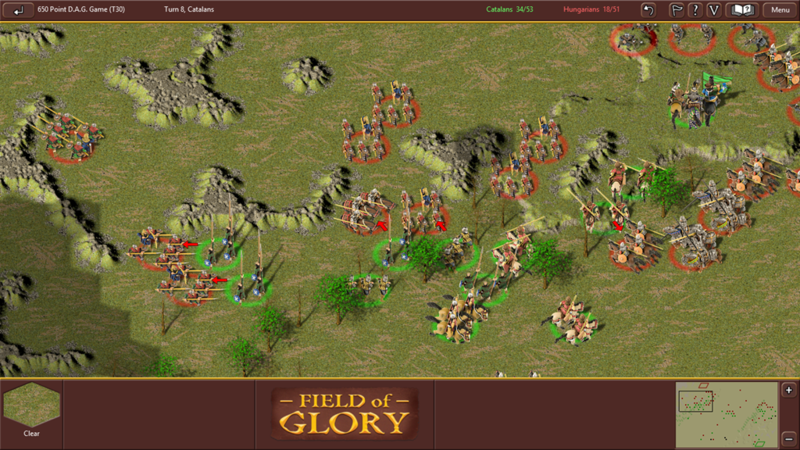 The game options let you switch everything off so that you are left with screens like those illustrated here, where you see the troops and a marker to show where they are engaged. You can also see from here the hex nature of the movement and firing system. The game is played on a hexagonal grid which controls movement and firing. Each element of troops exercises a zone of control around itself so to skirt through the enemy line you need to punch a hole in it. Like all good wargames too, troops are at their weakest when contacted in the rear and are also weak when contacted to flank. In fact, if I had to offer general tactical advice I’d suggest that the best option is to work the flanks. 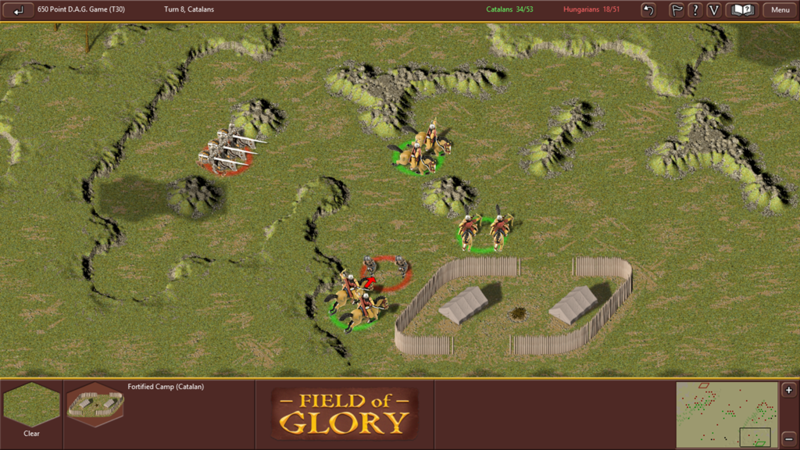 The game system also ensures that to contact a troop’s rear, you should be pointing towards it and past the flank of the troop, otherwise combat is on the front of the troop. The artificial intelligence in these rules is quite good too with some difficulty beating the computer. All-in-all, I like these rules and would recommend them to anyone who likes ancient wargames. January 2013 sees the ‘Worlds’ Wargames Championships being in Canberra, Australia. A range of competitions are scheduled, and if you or any wargaming buddies have any travelling plans at this time, please let them know their participation would be warmly welcomed. At this stage, I believe at a minimum, the competitions on offer will be DBA2.2, DBM3.2, DBMM2, DBR, FoG-R, FoG-A, FoW and others. The followinghas been posted and feel free to pass it on to anyone else. ”For those who weren’t aware, Cancon; the largest wargames competition/convention in Australia (probably the Southern Hemisphere?) has been confirmed as the ‘Worlds’ event for 2013. Cancon is traditionally held every year at the end of January over 3 days in Australia’s Capital, Canberra, and attracts huge numbers of gamers in many different competitions, display and participation games. It is also strongly attended by traders such as Eureka, Essex Australia, and many others. By a happy coincidence, 2013 is also the centenary of Canberra’s founding as the capital of the Commonwealth of Australia, and there will be a lot of events going on, in and around the city at that time, with something for everyone. See http://www.canberra100.com.au/ for some details. Canberra also houses a truly world class military museum in the Australian War Memorial, and any historical gamer should find something there to appeal, whether it is the Japanese Mini-Sub trapped in Sydney Harbour, Lancaster G for George or the WW1 Aircraft. Canberra is located a short motorway drive from Sydney, about three hours – I do it once a month on average and would recommend a coffee stop at Goulburn at the big Merino which will enable visitors to have some good teasing material for the championships. By any standards it is a beautiful city, easy to get around and a great base whether you want to visit wineries, the sea or the Snowy Mountains (although snow in January is a rarity in Australia). Late January is essentially just a little past halfway into the Australian summer, so a really great chance to warm up from the Northern Hemisphere winter – just be sure to pack your sunscreen (50+ is recommended for the Aussie sun)! Canberra also has a thriving and extremely varied restaurant and dining scene, excellent arts facilities, national museums, galleries and so on, so there is plenty to do for partners and kids. Canberra Games Society will be the hosts, and we will do our best to look after visitors and make sure you all feel welcome. So if you ever wondered how much a Koala could bear, or wanted to snorkel the Great Barrier Reef, why not do it to coincide with Cancon 2013 and take 3 days to have some fun games and possibly win a World’s Title! 244,406 hits. Note that I had 258,644 hits on the Hole before moving here.